Michelle Obama says we are “in the midst of a huge recovery.” That claim is laughable to anyone who has lived through the last four years; this simple chart from the Senate Budget Committee highlights one of the central failings of Obamanomics: people are leaving the labor force faster than they are entering it. Obama’s fortunes are rooted in voters’ dimming expectations for the economy and the federal government, and their apparent conclusion that the country’s current misery is not entirely the president’s fault. Polls show Americans appear resigned to an economic future only mildly better than the status quo. Their disgust with Washington has left them skeptical that anyone can lead the country out of the slog. Further muddling the economic dynamic is the emerging evidence that Americans have lowered their expectations for growth—yet they remain eager to grasp at any indication that they are wrong. Voters see the economy, ever so slowly, improving. It’s a critical distinction. If things were getting worse, economists say (and even Obama campaign officials concede), the president would likely be losing. Instead, he appears to be benefiting from voters seeing slivers of good news where economic data suggest there are none to be found. Optimism is rising, improbably, among consumers, small businesses, and stock traders, with Democrats and (more crucially) a share of independents feeling better about the future than Republicans. As Goes Wall Street, So Goes Obama? Americans will choose their next president in less than two months and the race is a statistical dead heat as it enters the season that matters most: The one where Americans who are not political geeks start paying attention. The race will turn on how voters feel about the economy. Should President Obama be re-elected because it is headed in the right direction - 30 consecutive months of private sector job growth after precipitous losses during the George W. Bush presidency - or should GOP nominee Mitt Romney take the wheel because unemployment has been above 8 percent for more than three years, the longest stretch since the Great Depression? "The Democrats are rolling the dice that they can win a base-on-base election," said Republican strategist Ford O'Connell, who worked for the 2008 GOP presidential ticket. As the electoral map stands now, O'Connell said, Obama could be re-elected if he wins only one of three tightly contested battleground states where the race is tied: Florida, Virginia and Ohio. The race is also tight in Colorado, New Hampshire, Nevada, Iowa and North Carolina. Nearly six in 10 Americans approve of Obama's handling of terrorism; however, that is where majority approval of the president ends in the current poll. He earns his lowest issue ratings on the economic issue areas tested in the survey, with approval on the federal budget deficit the lowest at 30%, and his approval on the economy not much higher, at 36%. Historically, presidents who won a second term had near-50% job approval ratings or better prior to the election. To move closer to that range, Obama may want to focus singularly on raising his approval rating on the economy, as with previous presidents it seems to have been the issue approval most closely linked to overall job approval. 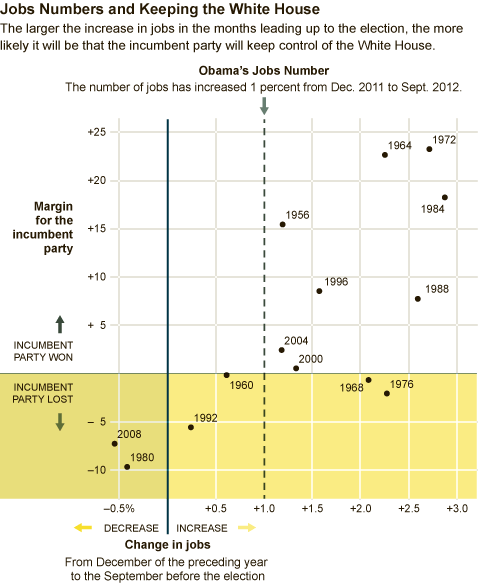 Although there are stark differences in the way each side views the state of the U.S. economy, there are two key things that both campaigns readily acknowledge: President Obama is unlikely to expand the electoral map the way he did in 2008; and this campaign, unlike the Obama/McCain race, is going to be close and very competitive. A spate of figures including a high jobless rate, reduced consumer confidence and a sluggish first quarter do not look good for U.S. President Barack Obama's re-election chances in November. On Friday, the U.S. jobless rate rose to 8.2 percent from 8.1 percent, marking what economists call the flimsiest economic recovery since the Second World War. Unemployment has hovered above the 8 percent mark for more than three years now, and there remain millions of people who have been out of work for more than 27 weeks -- the so-called "long term unemployed." Friday's disappointing jobs report led to lower consumer confidence by some counts -- on Monday Rasmussen's consumer confidence had sagged five points. And on Thursday, U.S. first-quarter gross domestic product grew a paltry 1.9 percent, missing economists' already weak 2.2-percent initial estimates. The news does not look good for Obama, who is running neck-in-neck with Republican challenger Mitt Romney in the lead-up to November's presidential election, in which the economy and jobs overwhelmingly top the list of voters' concerns. "He's not going to get any help from the economy. The big question for him is ... to make sure the economy just doesn't get much worse," said Republican strategist Ford O'Connell. Friday’s dismal jobs report and some unexpected words from Bill Clinton delivered a bracing reminder to President Obama and his advisers that the election remains primarily a referendum on his record and that their path to victory may lie less in trying to discredit Republican Mitt Romney and more in winning a battle of ideas with their Republican rival. By that measure, Obama has little time to show progress. The economy appears to have fallen into another spring slump, after signs in the winter that suggested the recovery was genuinely taking hold. And the president may have only limited ability to affect the biggest looming danger to the U.S. economy, which is the situation in Europe. It is no wonder that analysts say the president’s prospects for reelection are no better than 50-50. The president’s campaign has appeared wedded to a strategy of trying to discredit Romney. That began with attacks on his role at Bain Capital, the private equity firm where he made his fortune. Obama’s advisers believe it will have the desired effect on voters, but so far there is very little evidence that attacks on Bain are changing minds. Current polls continue to be extremely close. The Bain attacks have caused grumbles from Democrats who have friends and allies in the private equity world, but those complaints did not deter the president’s Chicago team from pressing forward.